I flew with Ryaniar yesterday for the first time and despite hearing stories from others I was really shocked at just how bad it is. I flew twice with them yesterday and on both occasions the aircraft was absolutely filthy, I mean deep ingrained, never been cleaned ever filthy. The lady across the aisle from me wiped her seat down with an antiseptic cloth before sitting down. The seat was like a wooden board, absolutely no padding whatsoever, no recline and obviously very uncomfortable as a result. I saw many people standing for much of the flight such was their discomfort. I appreciate their tickets are low cost and there is an element of getting what you pay for but I was shocked at just how bad the entire package is. When I compare it to their principle competitor easyjet they are poles apart. Hope you’re enjoying yourself wherever FRightmare whisked you too. I’d be interested on the route that you flew, and oddly the time of day the flights happened ? My experiences with Ryanair are on the whole reasonably good, then again I set my expectations lower than a rattlesnakes bum. I’ll add, I’ve had some really top class inflight service with them, probably motivated by the crew’s need to supplement their income. Having flown with Ryanair over 100 times since 1998, I cannot identify with a word of this post. That sounds like my first and last experience on Ryanair, which was about 15 years ago, STN-GRO. I only did it because the route and times were ideal for me. It cost me about £10 and they got me there on time, that’s the only positive I can say. I’ve never flown them since and hopefully never will, but I have heard from numerous sources that they are now much better, so your experience comes as a surprise to me. My seat was so filthy that I sat on my newspaper rather than let my clothes touch the seat, it was engrained with filth and muck and God knows what. The crew were tired, scruffy, irritable, and rude. The announcements from the cabin and cockpit were totally incomprehensible, not recognisable as English or Spanish, or Catalan. It sounded like a Korean with a speech impediment trying to speak Azeri with his head up his backside. On the other hand they were quite able to enunciate when they came round selling scratch cards! The airline has changed substantially in those 15 years – back in 2002, they still had some really old and tatty 737-200s. The whole fleet is 738 now. It’s still a low grade (basic) offer, but the aircraft are usually clean (though some show the effects of heavy use) and the crew are invariably pleasant and sometimes quite chatty, in my experience – maybe it’s the way one talks to them that elicits the response? One thing I would compliment Ryanair on is that they do not tolerate anyone talking throught the safety brief and will respond firmly – I wish more airlines would act this way. Can’t say Ryanair are #1 on my list, but I wouldn’t hesitate to use them if it suits, though not over 4 hours, as the seats don’t recline (which I find a good thing on shorter routes). 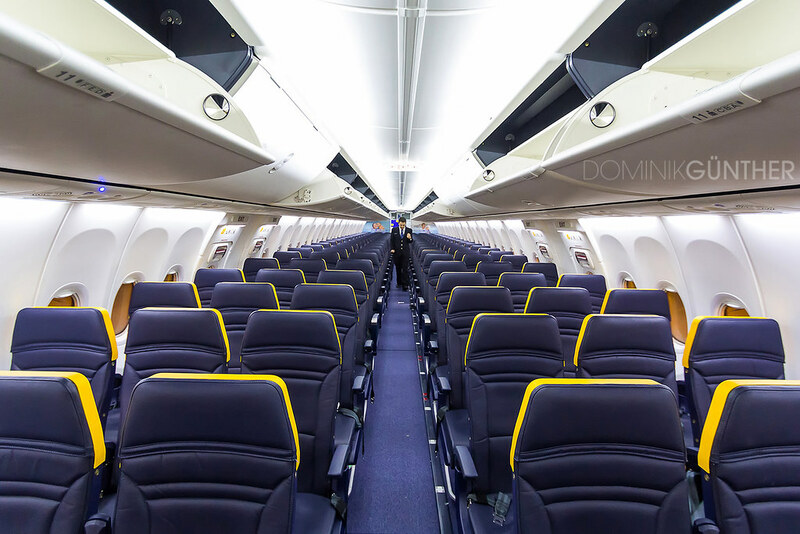 The yellow has gone from the overhead area – shame it is still on the seats! Completely agree with you on that. As an ex-airline employee, it infuriates me when people talk through the briefing and I invariably ask them to keep quiet, and get some pretty filthy looks and comments back! I know them off by heart (in fact at one time I used to make them) but I still put my reading material down and pretend I’m listening, just as a matter of courtesy to the crew. @canucklad – it was the Brussels – Berlin Schönefeld route. I do the trip around six times a year as I am a non-exec director of a Berlin based company and usually fly Brussels – Berlin Tegel with Brussels Airlines but on this occasion the meeting was moved to a new location and the Schönefeld option seemed easier. I have learnt my lesson! Good for you capetonianm, I have done the same on occasions. I heard recently that the announcements before the crash of US Airways Flight 1549 were repeated because there were a group of people talking loudly. I wonder how many lives were saved as a result ? the last time I flew Ryan was the first and last (and yes it was many years ago). I know they are cheap, I know they have their fans and I know they can be very elastic/imaginative with their geographical descriptions of their destinations and most (not all) of the airports they use are not the easiest to get to using public transport. PhilipHart -Charles-P, I bet it was cheaper than firing up the Pilatus ? On what authority do you intervene? You are a passenger, not a crew member – this type of action can create conflict and is just as bad as the people who talk, IMO. If the crew are on the ball, all talking should be stopped and Ryanair are on the ball. Flying with MrsO and checking in online (had not prepaid for any extras) 2 days before the outbound and the full 5 days before the return, we were allocated seats 16 rows apart on the outbound and 9 rows apart on the inbound. This was the first time I have had the experience of this happening on any LoCo flight. (We fly around 10 sectors a year on a combination of Easyjet, Norwegian and Ryanair). After my irritation dissipated I looked at the option to be seated next to each other and there was plenty of availability. It looks to be nothing more than a blatant attempt to allocate 2 pax travelling together in different parts of the plane, in order to then encourage them to pay extra to pick seats next to each other. This we did, and bizarrely for the exact same seat the price on the inbound was more than the outbound. The plane on the return leg was filthy, worse than I’ve ever seen on BA, who I generally find to have poor standards of cleanliness. The fare was not cheap – close to £200 per person return. To be fair we had to fly on the dates we did and ideally from STN or LTN on this occasion, though we did book at least 2 months prior. The plane on the way back had their latest seats, and boy are they uncomfortable. The original ones certainly seem to have a little more cushioning. The crew were fine, though clearly look to be incentivised to sell. Incessant announcements about scratch cards, tax free shopping and even a drinks run 20 mins before landing, after the seat belt sign was on! Still, they do serve a good cup of coffee, unlike EZY. I think that’s rather highhanded of you, I don’t think anyone needs third party ‘authority’ to ask people not to behave in a manner which might put others in danger. I don’t get up and yell at them, but if they are near enough to prevent me from hearing the announcement, I ask them to be quiet so that I can hear the safety briefing, even if I know them off by heart, others don’t. I’m sorry if you have an opposing view on that. Yes, but most other airlines aren’t, although it does seem to vary with the crew. I was on an EZY flight the other day and the cabin manager gave two women a full on bollocking over the PA – without being rude or aggressive, but put them in their place, and then went and had a word with them afterwards. @AlanOrton1 – it seems the cleanliness issue is one experienced by everyone. I don’t care how cheap the fare is, that’s just not acceptable from any airline.